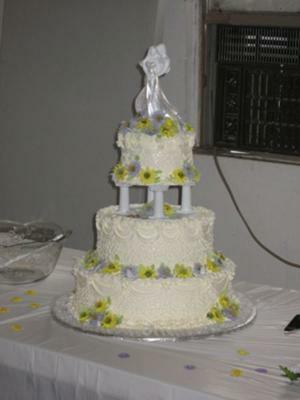 This wedding cake was a traditional 3 tier, white cake with buttercream icing and filling. The tiers were 14", 10", and 6". I decorated the surface with cornelli lace, buttercream drapes and shell borders with some large stars. The flowers were all made out of gumpaste with royal icing centers and buttercream leaves. The cake top was a Wilton topper.